Sterling Silver Napkin Holders, an enhancing piece of tableware to decorate the Shabbat or Yom Tov table. 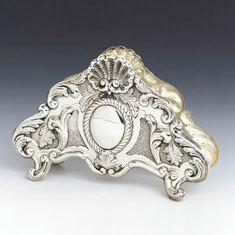 Silver Napkin holders Make a beautiful Jewish gift for any occasion. Browse our fine collection of Sterling Silver Napkin Holders, we carry a wide selection from artists and silver craftsmen across the globe. For any questions feel free to call us @ 800-336-2291.